I’m Orthodox, so we actually celebrate Easter this coming weekend on April 15th. But this year, we get to celebrate it two times!! Some awesome friends of ours (thanks Jess and Ryan!) invited us over for a little Easter dinner this past Sunday. It was quite the feast: mac and cheese, cheesy potatoes, ham, green bean casserole, deviled eggs, rolls…the food was endless and delicious! 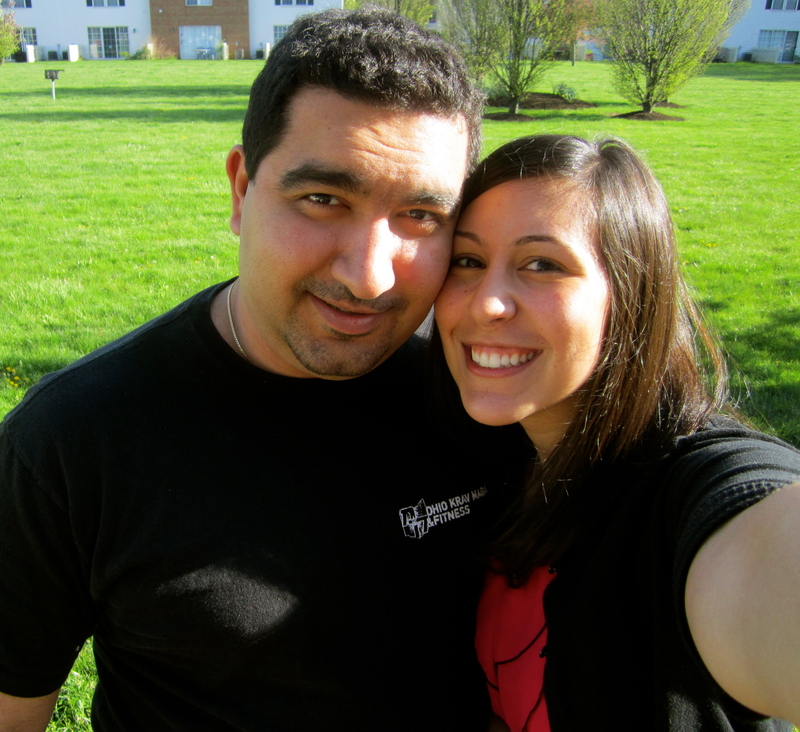 We typically eat a traditional Egyptian meal on Easter, so I had to ask Jess what their traditional Easter meal was. When she told me that it’s tradition to eat ham on Easter the first thing that popped in my head to bring was a Green Bean Casserole (second to dessert, of course!). 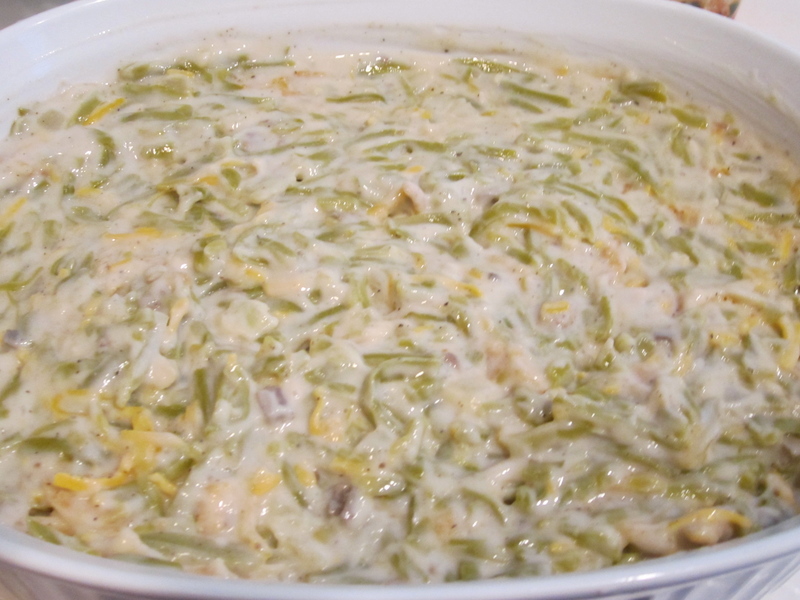 I have no idea why I choose green bean casserole, before Sunday I had never eaten green bean casserole, let alone made one! But after much research and a combination of a couple of recipes I seem to have come up with a pretty yummy dish! 2. Add margarine to pan on medium heat. Sauté mushrooms, garlic and onion in pan until onions are a golden yellow colored. 3. 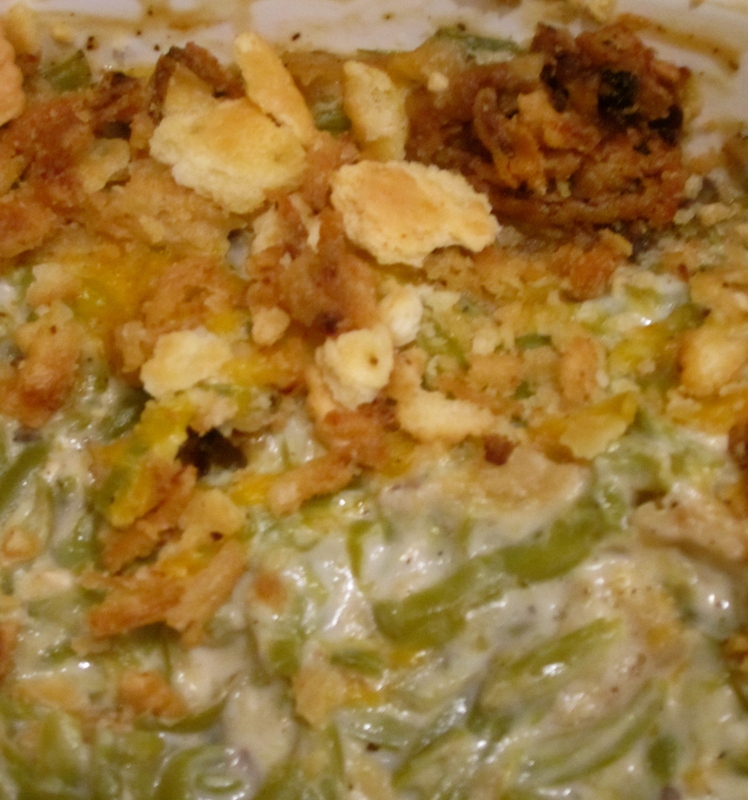 In 2 quart casserole dish mix together sautéed mushrooms, garlic, and onion, cooked green beans, cream of mushroom, salt, pepper, milk, 1/2 cup of french fried onions, 1/2 cup shredded sharp cheese. 4. 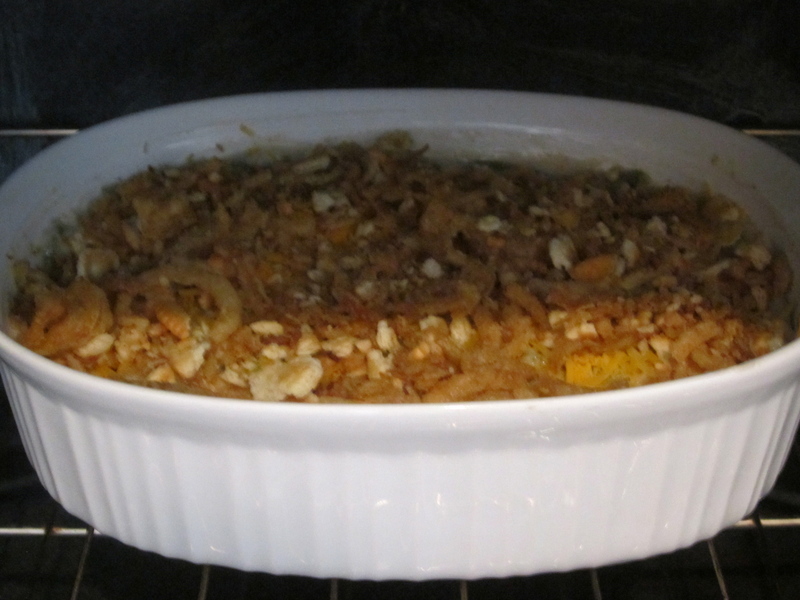 In pan, add 1/2 tablespoon margarine, crushed crackers, and remaining french fried onions – until golden brown. 5. Top casserole with remaining 1/2 cup of cheese and cracker-fried onion mix. 5. Bake in oven for 30 minutes, or until bubbly and golden brown. 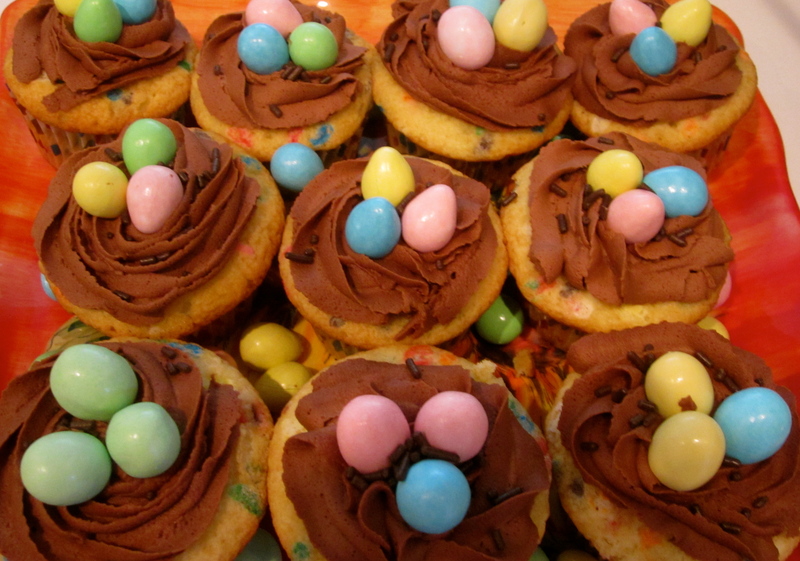 Of course I couldn’t help but bake some Easter cupcakes to take along as well: funfetti cupcakes with a chocolate buttercream icing! Delicious. 🙂 Recipes to come. After dinner, we went outside and played a little bocce ball. That was my first time playing… I have to admit, I wasn’t very good at it. But that’s ok – I kept saying “We’re all winners,” to make myself feel better. All in all, it was a great evening!